Laying under a sky full of (falling) stars. Oh yes, I am so predictable! But if the night is so dark that you cannot see your own body, the sky is so wide and unknown, you are in the middle of nowhere in a different hemisphere and your life is at a turning point… well… It can take your breath away. I felt so human and part of the divine in the same time, here and now and still forever and ever, miserable and still powerful and meaningful… It has been a full Sturm und Drang experience! (Ah, by the way, it was last summer, while being on holidays by the Colorado river, Utah, USA). I want to make a positive contribution to the world by making use of what I can do best: mobilize the business environment I am part of and be a scintilla that can fire up other people’s scintillas, so that we can be together agents of change. … inspire each other to let the scintilla that can make change happen spark. Dare beyond our normal thinking frame ‘If we don’t get lost, we’ll never find a new route’ once said the theater director Joan Littlewood. 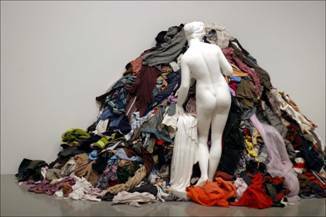 The Venere degli stracci (The rags’ Venus) from Michelangelo Pistoletto (1967) : a classical, pure, immortal Venus dealing with a mountain of contemporary rubbish… Very similar to the human soul: capable of elevating himself to the most poetical infinities and still able to trap itself in mean and sterile behaviors. 1. Be an agent of change in the business environment and empower other people dreams so that we can create together a more sustainable world.